The album’s other huge rocker ‘Run For Your Life’ offers some massive chorus whoahs and a driving rhythm that recalls the best in 90s melodic rock. There are traces of about a half dozen great bands here (from the era where so many people will tell you melodic rock was dead), not least of all Hardline, but keen eared fans may also hear the thrust of the Shotgun Symphony debut and perhaps influences from Red Dawn, resulting in a great, punchy rocker. The vocal chooses to display something fairly melodic throughout this track which very much sounds at its best when combined with a few harmonious backing vocals. With Alessandro Del Vecchio adding stabbing keys and Castronovo dropping a great intro that’s heavy on the toms, there’s a massive love for melodic rock’s past that’s obvious throughout. Likewise, ‘Remember Me’ combines a reasonable punch with a classic AOR hook with multi-layered vocals. It might be the kind of thing that both Gioeli and Castronovo could wheel out in their sleep but it still sounds great, especially when taking into consideration some tasteful, slightly pompy keys and a massive, dirty lead guitar break where Percudani indulges in plenty of string-bent theatrics. It’s easily an album highlight. Another clear stand out, the more mid-paced ‘Who I Am’ is a huge power ballad with elements of early 90s melodic rock thrown into its verses. The overall mood really allows Gioeli to stretch out, while the sweeping guitar styles present some of Mario’s finer guitar skills and a huge chorus is made of the finest AOR tropes. Sure, it’s all very much tried and tested, by numbers stuff that never tries to add any original quirks, but given the intended results and listening audience it’s nearly perfect. Imagine an old Hardline classic meeting with the best from their label-mates Snakes In Paradise and you’ll have more than a good idea what to expect…and you certainly won’t be disappointed. Also terrific, ‘It’s All About You’ is a huge power ballad with really unsubtle homages to ‘Keep The Faith’ and ‘These Days’ era Bon Jovi throughout, something that’s obvious in the basic chorus melody, but also in the way the vocal curls throughout. In terms of song writing, it has a lovingly familiar style and the kind of hook that taps into AOR gold, but real greatness comes through Percudani’s guitar work, offering an impeccably played solo that really shows off his fluid style. Finding a space between classic AOR and radio friendly hard rock, a cover of Lady Antebellum’s ‘I Need You Now’ re-imagines the track as Bon Jovi inflected rock, harking back to Hungryheart while simultaneously feeling like the kind of tune Gioeli and Castronovo were born to sing. Raising the voice above more soaring leads, the performances seems fairly effortless and is a good reminder – if one were needed – of why Hardline are still loved by so many. Castronovo, meanwhile, dictates a slow rhythm by alternating between bass and snare in a plod during the verses. This is something that works surprisingly well, if only for its low key mood to make the chorus shine more brightly. Factor in a few clean and choppy guitars and a fine lead guitar break and it feels like another decent throwback. The weakest track, ‘Mother’ all often comes across like a piece of light rock blended with musical theatre, but even that has enough AOR charm to just about see it through. Yes, the chorus vocals and saccharine melodies have the potential to be a little irksome, but between Gioeli occasionally exploring a Steve Perry inflection within his voice and some more finely played guitar, it feels like a natural avenue for the musicians to explore and a reasonable addition to an already enjoyable album. For those who love a big chorus, ‘Through’ is on hand with absolutely massive harmonies – an example of when Gioeli and Castronovo’s voices blend so well, while a deftly played guitar adds another great solo which, much like ‘Who I Am’ is more than content with recycling a few classic AOR moods – and somehow it feels all the better for that. 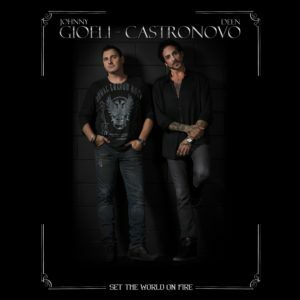 So often, a feeling of familiarity is just what you want from melodic rock, especially when it comes to a couple of stalwarts; Gioeli. Castronovo and chums manage to hit the spot by merely staying firmly their a comfort zone. Falling somewhere between Hardline, classic Bon Jovi, HungryHeart and ‘Walk In The Fire’ era Strangeways there’s more potential for melodic rock gold, even if the end mix feels a tad claustrophobic. So, in terms of both songs and performances, ‘Set The World On Fire’ is more than solid. As is so often the case with releases on Frontiers Records, sadly, its big drawback is the production and mix – and Alessandro Del Vecchio’s lack of technical finesse in that department has reduced half of the material to being nowhere near as crisp as it really deserved to be. There’s not enough lightness or anywhere near the feeling of separation between the instruments such AOR deserves. If you can get past that, though, ‘Set The World On Fire’ is a record with a lot to give, especially if you like old style melodic rock songs delivered in a way that’s utterly knowing of its audience. Read a review of Hardline’s ‘Human Nature’ here. Read a review of Hungryheart’s ‘One Ticket To Paradise’ here. Read a review of Journey’s ‘Eclipse’ here. 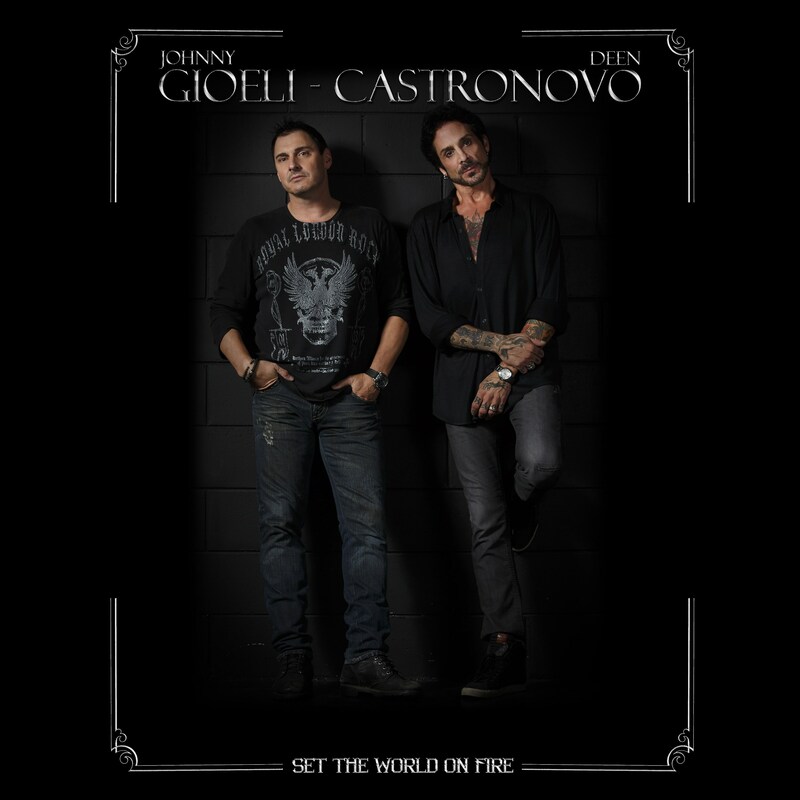 This entry was posted in Album & EP Reviews and tagged alessandro del vecchio, aor, deen castronovo, frontiers records, hard rock, hungryheart, johnny gioeli by Real Gone. Bookmark the permalink.